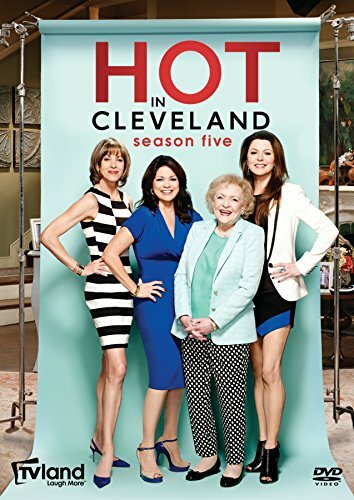 Los Angeles, CA - TV Land's wildly popular hit series is back with more hilarious antics as Hot in Cleveland: Season Five debuts on DVD November 4, 2014. Featuring a star-studded cast including Valerie Bertinelli ("One Day at a Time"), Jane Leeves ("Frasier"), Wendie Malick ("Just Shoot Me") and Betty White ("The Golden Girls"), the uproarious fifth season also boasts a sensational array of guest stars including Jason Priestley ("Beverly Hills, 90210"), Sarah Hyland ("Modern Family"), Chevy Chase (Christmas Vacation), Ken Jeong (The Hangover), Dave Foley ("The Kids in the Hall"), Chris Isaak (musician), and many more. "Hot in Cleveland" delivers more twists and turns in Season Five, as the ladies juggle romances old and new, adopt a puppy and travel to New York to cross items off of their bucket lists. Watch as the ladies are under intense scrutiny by an FBI agent and Victoria goes to great lengths to keep her clandestine romance alive. With a second live season premiere and the first-ever animated episode, fans won't want to miss one minute of this hilarious season! The Hot in Cleveland: Season Five three-DVD set includes all 24 fun-filled episodes, including its landmark 100th episode. Arriving just in time for holiday gift-giving and the on-air premiere of Season Six, the DVD will be available for the suggested retail price of $29.99. "Hot in Cleveland" can be seen Wednesday nights at 10 p.m. on TV Land. "Hot In Cleveland" is executive produced by Emmy(R) Award-winner Sean Hayes ("Will And Grace") and Todd Milliner of Hazy Mills Productions and is helmed by Emmy(R) Award-winning Suzanne Martin ("Frasier," "Ellen") serving as executive producer, show runner and writer. Lynda Obst also serves as executive producer, and Larry W. Jones and Keith Cox are executive producers for TV Land. "Hot in Cleveland" is currently in production on Season Six and can be seen around the world in 211 countries. TV Land is the programming destination featuring the best in entertainment on all platforms for consumers in their 40s. Consisting of original programming, acquisitions, and a digital portfolio, TV Land is now seen in over 98 million U.S. homes.